Oh my, it's New year's Eve already. And the weather outside is nasty. We're having snow showers/ sleet/ ice storm/ rain. So, why not stay indoors and work on puzzles at Jigzone? Or, better yet -- work on this one. Jigzone says that we can embed a puzzle into our blog sooooo, here goes. Sorry about that. I've tried all the formats, even those where it says it will Overlay Blogger's narrow width and all it does is hide under Blogger's borders. So you'll have to click on the picture of the puzzle and the link will take you to jigzone. 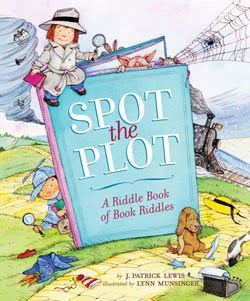 Spot the Plot -- a Riddle Book of Book Riddles by J. Patrick Lewis. Illustrated by Lynn Munsinger. San Francisco, CA: Chronicle Books, 2009. Available now. Let's end the year with some fun! What the heck is a riddle book of book riddles? Just what it says -- each riddle describes the plot of a book you should know. The answers are listed in the back of the book -- as titles on the spines of books piled high. Useful for teachers and parents. The Nonfiction Monday roundup is located at Practically Paradise today. We've been trying to keep the house warm with electric heat -- which works well enough when the outside temperature is 40 degrees. But as soon as it goes below freezing, and stays there, we have to start using the wood stove to keep warm. But first -- the chimney has to be cleaned. Normally we get this done sometime in the fall, but this year December suddenly came upon us and we realized that it had not been done. Can't begin wood stove heating season with a dirty chimney. Dangerous? Not really. This stone house has been sitting here since 1740. What's to burn? The walls are 2 to 3 foot thick stone walls. And the shingles on the roof are fire resistant. My husband cleaned the chimney a day or so ago and lit a fire in the wood stove last night. This house was built to be heated with wood -- every room has a fireplace. Do we have enough cookies? pies? Should I get the roast beast today or tomorrow? (I got it today and it's sitting in the refrig as I type.) What else do we need for the 25th? Making a list and checking it twice. Also, I finally bit the bullet and joined Facebook. Now how can I get my blog to show up there as well as here? Fan page? What's a Fan page? For this nonfiction Monday, I'd like you to check the Caldecott winner of 1999 -- Snowflake Bentley by Jacqueline Briggs Martin, Illustrated by Mary Azarian. (She's the one who got the medal) Boston: Houghton Mifflin Co. Available in your library, or any bookstore will order it for you. Once there was a boy who loved snow. (like me) When he was 17 years old, his parents bought him a camera. Since he lived in the late 1800s, it was a huge camera that used glass negatives. He figured out how to photograph snowflakes and discovered that no two snowflakes are alike! The book of his snowflake photographs, Snow Crystals, is still available and would be a wonderful secondary source to share with the child who reads Bentley's biography. Although the 'story' part of the biography uses simplified sentences and is quite short, there are sidenotes on all the pages giving more facts. The Nonfiction Monday roundup is at SimplyScience today. Well, the total snowfall in our area of Maryland (as computed by the snow piled on top of the trash cans by our house) was about 20 inches. The sun is out now, temperatures are hovering around freezing (up from 22 degrees last night), and the snow is compacting. My husband is outside doing a final snowplowing of our 200 yard long brick walkway and our much, much longer driveway. We know from experience that, if we can expose the bricks to sunlight, even in below freezing weather, the trace of snow left after plowing will disappear and we will have a dry, ice-free walkway out to our cars. And an ice-free driveway up the hill to the road. Now, contesting with the county snowplow will be the problem. County snowplow throws a three foot embankment of snow and ice across the opening to our driveway. We clear enough away to get our cars out and another snowplow blocks it up again. grrrr. Sooo, how was YOUR weekend? I'm a-thinkin' I'll be doing more online shopping instead of going to the mall this year. I feel sorry for the stores with no customers, but if I can't get there (or to the post office to mail packages), what else can I do? Well, the East Coast has been hit with a NorEaster of a snowstorm. Think back to the blizzards you used to know. Yup. That's what is happening right now -- here. They're predicting about two feet before it's all over. I spent all day yesterday at work complaining (off and on) that the Saturday staff had it lucky -- they would be able to do Christmas shopping and mailing of packages on Friday AND have a day off on Saturday with the libraries (etc.) closed. Whereas -- we had to work Friday and would not be able to finish our shopping and mailing -- all things that I had planned to do on Saturday. The 10-year-old and I added to the grocery store mob scene. We stopped there to get milk -- and supplies for making cookies. I figured that we could do the major grocery shopping for the house on Sunday when the storm is supposed to be over. But from the looks of things outside right now, I'm not sure just when grocery schools, libraries, and schools will re-open. It's possible things will be closed on Monday as well, while parking lots are bulldozed out. My husband stayed up late putting extra wheels and the snowplow on our Gravely mower. He usually plows several times during storms like this. Once he did this and pushed the snowplow out of its storage place -- it refused to start. This means that we will have to shovel snow. All two feet of it. It's going to take us all day Sunday to shovel out. Think of us as you enjoy your (comparatively) 'warm' day. 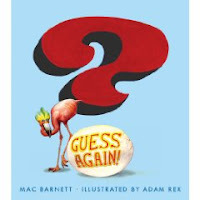 Guess Again, by Mac Barnett. Illustrated by Adam Rex. New York: Simon and Schuster Books for Young Readers, 2009. Available now. because your first guess will be WRONG. This book seems to be the same thing. A poem which looks like it's made up of two couplets. The first two rhyme, leading you to think the answer to the riddle -- the last word of the fourth phrase -- will rhyme, as well. It's so wrong that it makes no sense. Just why would the pirate's mother be on his shoulder -- when the sentence before ends in "share it," leading you to believe the answer will be Parrot? When the illustration also leads you to believe that there is a parrot on his shoulder. I wonder why this book is classified in the poetry area (where it will get lost, overlooked, ignored) and not in the riddle area where it properly belongs? Your guess is as good as mine. Even the title page will have librarians guessing, because the Verso material isn't on the Verso. It's facing the Title page. And what does the robot pictured on the end papers have to do with this book? If you check the reviews on Amazon.com, you'll find people with an opposite view of this book. One thing I did notice -- all of the favorable reviews there were by parents with boy children. The parents of girls complained that it wasn't funny and their child didn't like it. In-ter-est-ing. 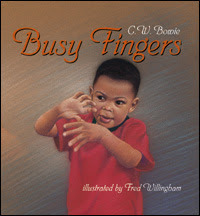 Meet the author and illustrator and get activities at Simon and Schuster's webpage. The other books being reviewed for Nonfiction Monday are being collected at In Need of Chocolate today. Today was our annual Brunch with Santa at the library. I was all set to use the theme of "The Night Before Christmas," when it occurred to me that my new picture book would fit one of my alternate themes. So, I put the Night Before Christmas books back on the Christmas book display and gathered up others. Then I threw in the new Jingle Bells pop-up book and gave the children all jingle bell bracelets to shake while singing the song with the book. This plus my new manuscript, and showing off some of the other new Holiday books rounded out the program. This year's Santa was a semi-retired store Santa, with a REAL white beard. He was wonderful with the children. Much thanks to the Joppatowne Woman's Club for holding this event every year at our library for the past 30 years. If you need to get away, taking a writer's retreat is a nice way to get your writer's juices flowing. 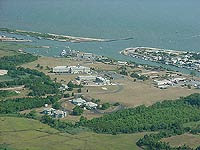 This past weekend I attended one on the Eastern Shore of Delaware. Like the view? Well, remember, I saw none of this because it rained all Saturday. I had intended to work on my Lance (the dog) stories. And maybe fiddle with one or two other things. However, you may have noticed that my Vermont College Advisor, Julie Larios, challenged me to turn a November Blog into a picture book. So that became the first order of the day. My first attempt, not so good. I simply re-wrote the blog from the viewpoint of a child. hmmmmm. My second attempt was better. But I realized that I would need the names of many more pies than just pumpkin pie -- delicious as pumpkin pie is. So I ran out of the "quiet" writer's room into the noisy one. Help! Help! I wrote my plea for pie-help on the whiteboard. (In an attempt not to disturb those intent on their computers) But when I turned around, about seven writers had left their own writing and had crowded around the board. (Any excuse for a break from writing, right?) This pie. That pie. It wasn't but a few minutes until I had enough pies -- many of which I had not thought of before. Yea! I LOVE when the group mind goes to work. I presented the resulting picture book during the evening reading session. I'm definitely going to go to next year's writing retreat, even tho it's scheduled to be in West Virginia, which will probably be an even longer drive away. Mount Rushmore by Thomas Kingsley Troupe, illustrated by Matthew Skeens. Minneapolis, Mn: Picture Window Books (Capstone Press), 2009. available now. The information in this book is bookended by a park ranger. Although the text is printed in large typeface with short sentences which makes the book accessible to first and second graders, the remainder of the book is supposed to be the talk he is giving to tourists. Did you know that Mount Rushmore was not the first choice for carving historical statues? Mr. Doane Robinson originally planned to include heroes from the history of the American West, including various Native Americans, on some of the tall rocky peaks in the Black Hills of South Dakota called The Needles. But they were too fragile. The final carving (done by blasting dynamite. then fine-tuned by other rock carving tools) shows four U.S. presidents instead of Western heroes. Of the three books suggested "to learn more" section in the back of the book, one is produced by the Mount Rushmore History Association, which leads me to believe the information presented here is as accurate as can be. More facts. Glossary. Index. On the web. And a list of all the books in the American symbols series. Disclaimer -- This book is part of a box of books sent to me from Capstone. The remainder of those books will soon find their way to a nearby school library. I'm taking a long weekend from work to go on a writing retreat. It's been great! Nothing but writers here. Although we are sitting in a conference center at the mouth of the Delaware Bay, with the Atlantic Ocean within sight, the weather outside does NOT tempt us. High winds and torrential rains! Further inland is being hit by snow, but we just have cold windy rain. Will we have to drive home in this? Nope. It's supposed to be sunny tomorrow. It's a conspiracy -- forcing us to stick to our computers and not be distracted by wanting to walk beside the water. I've just discovered that there's an Intercollegiate Quidditch Association with over 200 teams! For a slide view of some of their games, click on the link. The IQA started in 2005 as an intramural league at Middlebury. The rules were adapted from JK Rowling's Harry Potter novels by Alexander Manshel, the first Quidditch Commissioner. In 2006, Alex Benepe took over as the Middlebury Commissioner, and in 2007, he founded the IQA, following the first Intercollegiate Quidditch match between Middlebury College and Vassar College on November 11th, 2007. Since then, more than 200 institutions from around the world have joined the league. The vast majority are based in the US, and are divided among five regions: The Northeast, Southeast, Midwest, Southwest, and Northwest. Other countries with teams or leagues that play by the IQA rules include Canada, Mexico, Argentina, England, Iceland, France, Israel, and Australia. Additionally, dozens of High Schools around the world have started playing by the IQA rules as well. In an effort to standardize the rules as much as possible, the IQA will distribute its official rulebook to any team, of any age, representing any institution (clubs and community groups are allowed as well) in any country of the world. Currently the rulebook is only available in English, but that will change soon. WOW. I think I'll go back to college. It looks like more fun than the standard football/ soccer/ whathaveyou games. Labels: College Qudditch, for real, would I kid you? Nubs, the True Story of a Mutt, a Marine & a Miracle by Major Brian Dennis, assisted by Kirby Larson and Mary Nethery. Illustrated by photographs. NY: Little Brown, 2009. Available now. This story of a dog in Iraq has touched the hearts of millions of people. He was the leader of a pack of semi-wild dogs near a fort in western Iraq on the Iraq/ Syria border. U.S. Marine teams visiting the fort made friends with the dog and named him Nubs -- because his ears had been cut short and all that was left was little nubs of ears. But his special friend was Major Brian Dennis. Who paid for the dog's plane ticket? Many, many people donated money -- both local soldiers who knew the dog and many friends of friends back in the states. Watch a video of Nubs here. 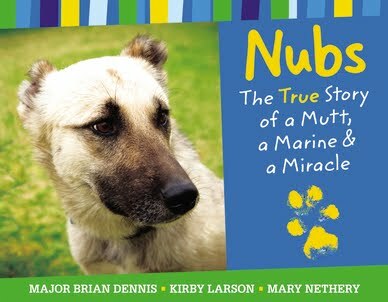 Nubs also has a website. More Nonfiction Monday reviews are over at the Book Nosher. I don't think it's fair that kids get two birthdays and I only get one. They get the 'weekend' birthday that their friends are invited to. Plus, their birthday in the middle of the week for family. The weekend birthday is nice. The soon-to-be 10-year-old and her friends go to someplace interesting (interesting to kids -- for adults, not so much) and have an hour or so of fun, have cake and ice cream (or icecream cake like we do) and go home with a goody bag of funny toys. (This year we gave everyone small parasols, bubbles, and a ratchety noisemaker.) A lot of gifts are given to the birthday girl. Toys, dolls, and some really neat t-shirts that are too small, and some really neat t-shirts that actually fit. Her favorite gift was actually three gifts from her best friend. 1, Three cats done by paper folding, representing cats now and those long dead. 3. And a pair of Pajamas exactly like best friend's. Which both of them wore Saturday night while best friend and she had a sleep-over. Double digits! She can't wait to become a tween. In case you are wondering -- did I get any writing done this weekend? Chose a publisher and composed a cover letter for a manuscript. But my printer ran out of ink. Once I get the new ink cartridge, I'll be good to go. This year it was 23 pounds. They claimed that it was the smallest they had. Now, just what am I going to do with that much turkey? It's going to take 8 hours to cook. Well, off to check if my pies are done. Good thing I have a double oven. I can do pies and the turkey at the same time. 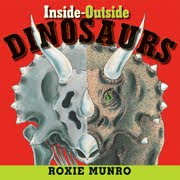 Inside-Outside Dinosaurs by Roxie Munro. Tarrytown, NY: Marshall Cavendish, 2009. Available now. Well, I asked the person who processed new books in our library branch for a new, limited vocabulary nonfiction -- and that's certainly what I got. Limited, yes = only three words per double-page spread. Easy-reading, not necessarily. Well, adults have problems with those dinosaur names, but not kids. Put this in the hands of a dinosaur-loving kid and they'll rattle off the names likity-split. Double page spread of a set of dinosaur bones put together. Slightly smaller, but still large print (all lower case) translation of the dinosaur's name into English in the lower right hand corner. lower right = "arm lizard"
The next page shows a scene, in full color, with the Brachiosaurus front and center, with other dinosaurs nearby -- flying, chasing prey, eating, etc. In the back of the book, there is a little more information about the main dinosaurs featured on a page. However, there is no information (except for the names) of the other dinosaurs pictured. Seeing these pictures first with skeletons and then in full color, we can often see right off how they were named. The 'crested lizard" has a huge crest. The "plated lizard" has plates sticking up from its spine. And my favorite, the Triceratops or "three-horned face" does have three horns. But the "arm lizard?" That still confuses me. I'd better find a 5-year-old to explain it to me. Jump on over to the Practically Paradise blog to check out more Nonfiction Monday reviews. How many times did you revise that manuscript? A Maryland writer of fiction for upper elementary and YA readers, Mary Amato, has just posted a video she made, tracing the amount of work she did on her latest book, Invisible Lines. All the revisions, the decisions, etc. She aimed the video at teachers and students to illustrate the process writers go thru when writing a book. And everything she says about the long writing process is so true for all us writers -- of nonfiction as well as fiction. Last week I explained Nonfiction Monday. Today (Friday) the Kidlithosphere celebrates Poetry Friday. There is a good explanation of Poetry Friday over at Chicken Spaghetti's blog. I heard from some of my writing friends the other day. "What are you doing?" one asked. They all had writerly tales to tell. "I'm working on my YA novel. Whipping it into shape." "I'm gathering recipes (and trying them out and tasting them, yum) for another cookbook." "I'm almost done with a magazine article about things long ago." And I didn't know what to say. I cook with old family recipes. I haven't written a magazine article in a long time. I felt very un-writerly that day. and had worked on some things that were still vague ideas. I had queried some agents. I had submitted manuscripts to editors. I had organized my writing expenses. I HAD done writerly things. Labels: an essay about being a writer and living a life too, What are you writing? November is Pumpkin Pie month. No, it's not a nationally recognized thing -- it's just at my house. The first week of November I made two pumpkin pies. One for my husband to take into work for their early Thanksgiving celebration, and one for the family to eat. Last weekend was my husband's birthday. He doesn't like cake. He only likes -- pumpkin pie. Therefore two more pies, one decorated with candles. The second for the family to have, because one is never enough. This week end I have to make more pies, because I'm having a Pumpkin Pie, Oh My! storytime at my library and, of course, I have to bring pumpkin pie -- enough for the program and for the staff too. And another (or two) for my family to eat. The final week in November? More pies, of course. It's the 9-year-old's birthday. About Penguins, a Guide for Children by Cathryn Sill. Illustrated by John Sill. Atlanta, GA: Peachtree, 2009. Available now. I knew that Peachtree did luscious picture books, but I didn't know they also produced easy reading nonfiction with luscious illustrations like this one. Evidently part of a series. (The "About" series.) I'll have to keep my eye out for the rest of them. Evidently, John Sill is a prize-winning wildlife artist. It shows. Double page spreads having the illustration on one side and the words on the other can often look very textbooky. (yes, Mr. spellcheck. I do know that's not a real word.) But the illustrations here are so photographic that the whole thing works. Not only that, but each illustration is labeled with "Plate #..." This refers to a section in the back of the book which gives more information about the penguins pictured there or what they are doing. Early readers will be satisfied with the simple sentence on the page. "Penguins are seabirds that cannot fly." Parents or advanced readers can learn more in the back section. "Cathryn Sill uses simple, easy-to-understand language to teach children what penguins are, how they look, how they move, what they eat, and where they live. Illustrator John Sill introduces readers to a variety of penguins (17), from Adélie to the Rockhopper, to Emperor." This week’s Nonfiction Monday Round-up is at Tales from the Rushmore Kid. Wow, she's created a whole new Nonfiction Monday symbol in my favorite color -- green. This past Wednesday the library was closed for Veteran's Day. 1. Researching agents, again. Made note of some and actually sent a picture book manuscript to one. 2. Digging through papers to find all the legal stuff we'd have to bring to the post office on Saturday to get a passport for granddaughter number 2. (The family she's living with is going on a cruise next March.) Discovering that several items were not in my files. Contacting the other family to see if they had the right papers. They were missing some, too. Between the two families, we came up with all the right papers and brought them to the post office today. All the adults who had joint legal custody of our granddaughter had to be there to sign her papers in front of the post office representative. All this searching resulted in two bags of papers headed to recycling. In another day or two, I hope to winnow my piles of paper down and fill another couple of recycling bags. 3. Plus -- did a little revising of another picture book -- which might be turning into a short middle grade book. After the signing today, granddaughter number 2 came home with us to have an overnight with granddaughter number 1. She was eager to see her sister play soccer. But with the pouring rain soaking the playing fields this week, there was no soccer today. However, granddaughter number 2 will be able to watch granddaughter number 1 play soccer tomorrow before she has to return to her family. Unfortunately, it's at noon so we'll have to skip church. Both granddaughter love going to the church meeting together and sitting at the meditation circle afterwards. (added later, on Sunday) Darn. Soccer cancelled again. And this was to be their last game, so no more soccer for the 9-year-old. Soon she'll begin gymnastics as her Saturday sport. We went to church instead, where the kids met for Sunday School outside on the picnic grounds in the warm, 60 degree sunshine. Oh -- and we survived Friday the 13th with no problems. How was your Friday the 13th? What the heck is Nonfiction Monday? Recently, someone asked me to explain "Nonfiction Mondays." We bloggers take turns hosting the links to the various blogs that are participating in Nonfiction Monday each week. Last month, readers of my blog discovered that it was my turn to be the host. Do click on the link on my Monday blog to reach the master file and then click away to enjoy the various styles of Nonfiction Monday blog messages. And come back on other Mondays. I enjoy doing these short reviews every Monday. But since I'm a full-time children's librarian and also write books in my 'spare' time, I limit myself to reviewing picturebook nonfiction -- nonfiction for preschoolers or early elementary. Labels: weekly reviews of nonfiction books, What the heck is Nonfiction Monday? Never Smile at a Monkey and 17 Other Important Things to Remember, written and illustrated by Steve Jenkins. 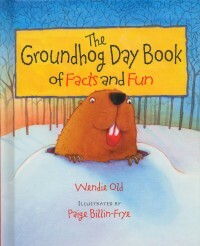 NY: Houghton Mifflin Books for Children, 2009. Available now. Oh my. Steve Jenkin's cut paper illustrations for his nonfiction books only get better and better. Clever librarians will place this book on display with both the front and back covers showing, because it's a two-parter. The words before the "and" are on the front with a perfectly normal monkey face. Take a peek at the back cover and don't drop the book -- as a monkey face seems to attack with all teeth showing, ready to chomp a chunk out of you. There are many animals that don't seem dangerous -- but they are. Jenkins discusses one per page (Okay, some are double page spreads) using clever titles like "Never corner a cassowary," "Never pet a platypus," or "Never clutch a cane toad." (I do love alliteration.) You'd never believe it, but most of these things can kill you -- or at least create pain and agony. For those who would like even more information, he includes additional paragraphs at the back of the book along with illustrations showing the animals in their attack modes, plus a short reading list. When I checked Amazon.com to see if I could capture a back cover for you to see (they didn't have it), I discovered that Betsy Bird (writer of A Fuse #8 Production blog) already did one of her marvelous reviews of this book, way back in September. The only excuse I have for being slow to notice this book is that it didn't arrive in my library branch until now. More Nonfiction Monday books are listed at Abby (the) Librarian. Every so often I'll post a link to various blogs that I think are especially good. One of them is Editorial Anonymous, the blog of a working Children's Book Editor. She usually posts about once a week and each message is dead on for people writing in this field. Click on her name to reach this week's message. Also -- Note what Rachel Stark says in the comment field about writers needing to practice their craft just like concert pianists do. Or, as I remember Jane Yolen saying at a reading in New York City -- "How do you get to Carnege Hall? Practice. Practice. Practice." 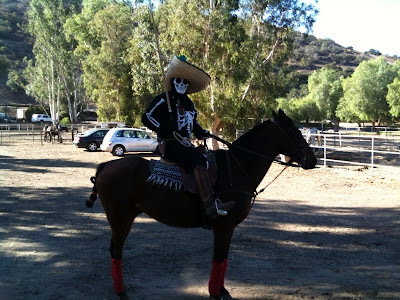 Here are a couple of pictures of my son-in-law at the Dia de la Muerto polo game in Del Mar, California, this past weekend. Yup, they played the game dressed in costume. He says, ". You can't quite tell but I had two pistols, an ammunition belt and a big red heart pinned to the costume. 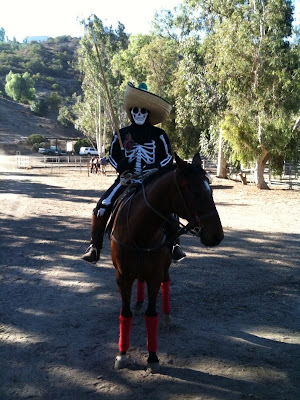 It was great fun to play polo with a big sombrero hat on (though a little hard to see)!!!" If you wonder why I linked to the flu website this week -- it's because the nine-year-old has the flu. She says she's better. She's soooo much better that of course she can go trick or treating tonight -- right? Wrong dear. Now I have two girls in the house mad at me. the nine-year-old -- for not letting her go trick or treating. It's only 5 more days until Halloween! Everyone have their costume picked out? Have your children tried theirs on umteen times already? Mine has. The 9-year-old is going GOTH this year and the 7-year-old is going to wear the 9-year-old's old Cinderella costume -- provided her adopted dad picks it up tomorrow. I thought I'd list some of my favorite Halloween books today. I say 'some' because, unfortunately, most of them are checked out of the library, so I'm sure I'll miss a lot of them. Naturally, first on my list is The Halloween Book of Facts and Fun, written by me, with child-friendly, not-scary illustrations by Paige Billin-Frye. Everything you ever thought you'd want to know about the holiday is in there, plus jokes and party plans. 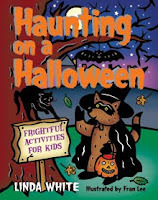 Next up -- Haunting on a Halloween, Frightful Activities for Kids by Linda White, illustrated by Fran Lee. Utah: Gibbs Smith, 2002. Halloween food ideas that kids can prepare. All highlighted by cartoon like illlustrations. 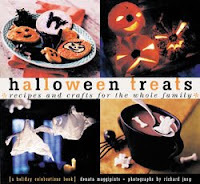 Halloween Treats, Recipes and Crafts for the Whole Family, by Donata Maggipinto. Illustrated by photographs. Chronicle Books, 1998. Each double page spread has a full page photograph on one side and instructions for the craft and food pictured on the other. yummy. 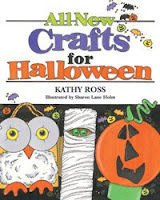 All New Crafts for Halloween by Kathy Ross. Illustrated by Sharon Lane Holm. Millbrook Press, 2003. Everyone knows that, if you want crafts that are child-tested and safe, ones that adults can easily prepare for large groups, you turn to Kathy Ross's books. Her books have inspired crafts for many of my library programs. Nonfiction Monday is being hosted by scientist and blogger, Roberta Gibson, over at Wrapped In Foil. Click on the link and enjoy all the different selections. Okay, I know I promised to post some of the information that I learned at the Romance Writers of American's National conference last summer, but life got busy. However, just today one of my favorite blogs, Brooklyn Arden, written by editor, Cheryl Klein mentioned how much she admired Jennifer Cruise. She gave the best workshop of the whole RWA conference -- two hours on plotting. AND she said that her plot sketches would be on her blog. Did I remember to post this information in my own blog? I did not. Soooo, here it is. Just click on her name (at the beginning of this paragraph) -- lots of great writing information to be found on her blog and on her website. I used to always read a blog called "The Tiny Little Librarian." (or something like that.) It was full of comments about the crazy and real things that happen in libraries. Then she stopped blogging. Well, a librarian at my own library system is putting similar things on her blog: Library Looney. Click there to see some of the weird and crazy things that happen in Maryland libraries. Have the same things happened in mine? yes indeedy. Yesterday was an important day for us. -- Two years ago we adopted our granddaughter. To celebrate, we took her out to Baskins Robbins for Ice cream and for some reason, she had a stomach ache last night. It couldn't have been the sundae, could it? Bananas. A scoop of pumpkin ice cream. A scoop of cookies and cream ice cream. Strawberry topping with whipped cream on top. No cherry. She doesn't like cherries. I have to say that it looked like more than my stomach could hold. -- Three years ago, my husband stopped smoking! He had tried before, but had gone back to smoking. This time it's for keeps. He hasn't smoked for three years. Not that he hasn't wanted to -- every so often stress gets him down and he really, really wants a cigarette. But he resisted and now it's been three years. 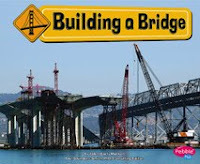 Building a Bridge by JoAnn Early Macken. A Pebble Plus/ Construction Zone book from Capstone Press, 2009. An easy reading book showing how a suspension bridge was built. Okay, there are a couple of words that are not easy, but children can ask an adult what 'suspension' is, and then will love saying the word over and over. Huge photographs of every stage of the construction bleed to the edges and sometimes even onto part of the left hand, double spread. The few large-type sentences are divided into four or five word phrases on the left hand of the double page spread. An artist has even labeled particular parts of the photographs, to point out special features such as the location of the "tower crane." Construction sites are fascinating to all ages. I know I want to stop and watch things being built, just like I did at age 4 or 5. If I have to use the excuse of "showing it to my grandchildren," why not? I know the grandchildren will be just as fascinated. Books like this take you to construction sites from the comfort of your own home. Adults reading the book, or having the child read to them, might wonder just where this bridge was built. I did. I kept looking at the city in the background of the pictures, trying to guess the location. The book never says. Plus -- Internet Sites as guided by something called FactHound. Hmm. Click on that word in the last sentence and explore it yourself. Evidently you need to type in this books's number = 9781429622578 = to reach safe internet sites related to this book. Nonfiction Monday is being held at Lori Calabrese Writes today. Click on the name to find more NF Monday reviews. At present there is a strange law says that bloggers who review books (not print reviewers, just bloggers) must acknowledge when they get books for free, and must also reveal any other connections they have with the publisher, writer, etc. I discovered several boxes of books from Capstone Publishers on my back porch one day. Were they individual books I had requested to see for reviewing? Nope. They were various easy-reading series the publisher thought I might like to examine for potential reviewing. Some are pre-pub and some are just published, which means that my library system doesn't have them on our shelves, yet. Libraries are closed today and I realized that I needed a nonfiction book to review for Nonfiction Monday, so I emptied the boxes and piled the books into various piles. Suddenly I realized that I had a handful of books by writers I know. I know that they do quality work and have high standards for research. I realized that I didn't have to wait for reviews of these books, I trust these writers. First up -- Laura Purdie Salas. I've known Laura for 15 years or more, ever since I wrote articles about the Moody Blues rock band for her husband's fan magazine -- Higher & Higher. She has written lebenty-hundred books, both poetry and prose. A Is for Arrr! 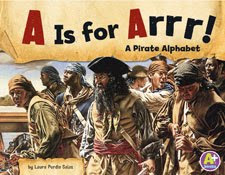 A Pirate Alphabet by Laura Purdie Salas. Mankato, MN: Capstone Press, 2010. Z Is for Zoom! A Race Car Alphabet. Even though the whole series has a copyright date of 2010, I do hope Capstone manages to get Y is for Yowl! into stores in time for Halloween. If not this year, then the next? Pirates have Quartermasters (yup) an a big fat X marks the spot. (So far so good.) The scary alphabet includes Q is for Quicksand, but falls down a little with X is for eXplode. It's considered cheating, but acceptable if the x is in the first syllable of the word -- and the beginning sound is X. The illustrations are mostly full page photographs. Many of them are close-ups of the alphabetical object being used, with plain backgrounds that make the object POP. The words don't intrude and don't overlap the photograph. (which would make it difficult to read) Instead they have their own, set-aside, area of the page. In the pirate book the background for the words looks like old parchment. Like an old map. The scary book has white lettering on a black tombstone shape. All aimed to assist the new reader to decipher the words. And the words? First and second grade level. Each letter and photograph are matched with two or three sentences describing them. Definitely a photo of a re-enactor caught in the act of taking a nap. Other illustrations in the same book are paintings or even look like scenes from a pirate movie. And a note to parents and librarians. Some books of this series include a craft. The note says that these are designed to be read aloud to a pre-reader or read independently by an early reader. More Nonfiction Monday sites are located here. Since today was -- Read The Very Hungry Caterpillar story to as many kids as you can DAY -- several of our public library branches did readings every half hour, using books, flannel board presentations, the pop-up version, etc. Unfortunately, I was only in my branch a few hours today, so I set up a Very Hungry Caterpillar craft, instead. Why is today - Read The Very Hungry Caterpillar day? 1. 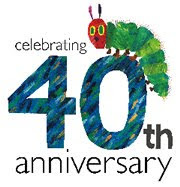 Because this year is the 40th Anniversary of the first publication of the Very Hungry Caterpillar book. To discover more about this event, and to see if they made their goal click here for the Jumpstart: Read for the Record campaign. Thank you for reading as part of Jumpstart’s Read for the Record, presented in partnership with the Pearson Foundation! I’m so happy that you shared Eric Carle’s classic, The Very Hungry Caterpillar, with a child in your life on October 8! Together we read to more than ONE MILLION children, breaking the world record once again - but numbers are still coming in! We will have the final number later this month. Thank you again for reading with us and helping us raise awareness for America’s early literacy crisis! This has been an important Campaign for Jumpstart and for children everywhere. I'm thrilled that you were a part of it. Well, that's just one more weird thing about this series called "I Like Weird Animals!" Do you have an early elementary classroom full of curious kids? All eager to learn amazing (and weird) facts about nature around them? And about strange animals they never knew existed? This is the book for you. -A full-page photograph of the animal on the right with four or five intriguing, descriptive sentences on the left. -Nine animals/ birds/ sea creatures/ etc. per book. -Table of Contents and an index. -A list of (3) books where you can find more information. -The books support the National Science Education Standards for K–4 life science. These are not books for reports on animals. They're books to spark an interest and a need to read and find out more. I have to confess that I have a connection to Enslow Publishers. They published seven biographies of mine. I stop by their booth every time I attend ALA, just to talk. One day I happened to mention to Mark Enslow that I had enjoyed another series of theirs and he thought there might be more Enslow series I would enjoy. A few weeks later the Lovely Lisa in Marketing sent two of the I Like Weird Animals! series to my library mailbox. Ah Ha! I know that author. So I wrote her and quizzed her about the books. I asked if she took the photographs herself? In her research she found many strange and wonderful creatures. The Enslow people looked for photographs of them. Some of the ones she wanted to write about had to be dropped because no photograph could be found. Who do you think will enjoy reading these books? "I wrote them primarily for second grade boys. That's why the word poop appears pretty often." What was your vision for this series? "The whole object was to find things that would make kids laugh and want to read more." Descriptions of these books can be found on the Enslow Publishers' website. For more weird and interesting children's books, hop on over here to see all of the Nonfiction Monday reviews. Ever wonder what an agent does? Click on over to Nathan Bransford's blog and find out -- he has a post the covers most of what they do. And they do all this before they get one red cent from the author. The Harford County Public Library (Maryland) is one of 200 libraries/schools chosen to host the Mo Willems Simulcast next week. What is a Simulcast? Well, instead of doing a fall tour this year, Mo will instead bring cameras into his studio and show us what it is like to create one of his books. 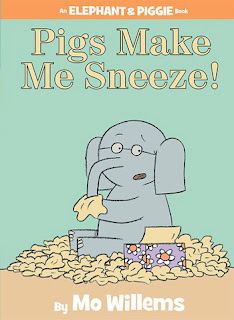 His newest book, Elephant and Piggie: Pigs Make Me Sneeze, will be the book that he focuses on, but I’m sure the Pigeon will have to get his two cents in. --What: Mo Willems Simulcast – a LIVE video visit. --Where: Bel Air Branch, located in Bel Air, Maryland. --Who: Mostly for the kids that love Mo’s books, but if adults or teens want to sit in we won’t turn anyone away – we’ll just fill up the room to its capacity. -- Why: Because HCPL is awesome! If you happen to live in Harford County or nearby, and want to attend, please call the Bel Air Branch and let the children's department know if you plan on bringing any students. It's in the middle of the day to accommodate those schools getting the simulcast, but homeschoolers are certainly welcome at the public library's simulcast. 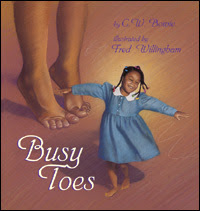 Welcome to the home of Nonfiction Monday for September 28. Bloggers, please leave your information and links in the comments section and I will post them periodically during the day. I can't wait to see what you are talking about today. 1. Mary Ann Scheuer at Great Kid Books has reviewed Heroes of the Environment, an inspiring look at 12 individuals who have taken action to help the environment. The families & teachers who looked at it with her agreed that it's perfect for upper elementary and middle school students. 2. Sarah N. at In Need of Chocolate posted about Many Luscious Lollipops. 3. Laura Purdie Salas has written about Emperor Qin's Terra Cotta Army. 4. Heidi Bee Roemer at the Wild About Nature blog has reviewed Laura Purdie Salas' book, Home on the Earth: A Song About Earth's Layers. 5. Jules at 7-Imp has an interview with Bonnie Christensen, who has illustrated---or both written and illustrated---many nonfiction titles, including her latest about Django Reinhardt. 6. Angela at Bookish Blather reviewed"Michelle Obama: An American Story by David Colbert. 7. Lori Calabrese Writes! highlights the Gotcha for Guys booklist that lists nonfiction books to get boys excited about reading. 8. Cindy Dobrez says that her Bookends Blog features I Can't Keep My Own Secrets: Six-Word Memoirs by Teens Famous and Obscure. We include our own teens' six-word book reviews and memoirs and some ideas for using this activity in school. 9. Amanda Snow at A Patchwork of Books has a review of The Secret World of Walter Anderson. 10. Shirley at SimplyScience has The Prairie Dog’s Town. 11. Amy Graves at The Art of Irreverence has reviewed It's Perfectly Normal for Banned Books Week. 12. Jone at the Check It Out edublog is tying together Banned Book Week and the 1st Amendment. 13. Sally Apokedak at All About Children's Books reviewed Sand to Stone and Back Again, by Nancy Bo Flood and Tony Kuyper. 14. Loree Griffin Burns has a Nonfiction Monday post up at her blog where she muses about why she loves nonfiction and recommends two of her favorites. 15. Barbara Kerley reminds us that over at INK: Interesting Nonfiction for Kids, they have new posts by authors David Schwartz, Anna M. Lewis, April Pulley Sayre, Melissa Stewart, and Linda Salzman. 16 Liz B joins in with a review of The Betsy Tacy Companion by Sharla Scannell Whalen. 17. Anastasia Suen at her Picture Book of the Day blog (she has several blogs) discusses Stonefish: Needles of Pain by Meish Goldish. 18. 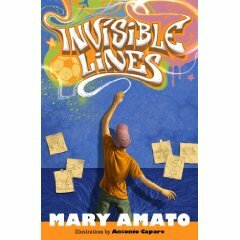 3T (which stands for three library turtles) has a guest review by Ami about a new book series from PowerKids Press. 19. Bri Meets Books reviewed Sea Soup: Zooplankton by Mary M. Cerullo. Under the Snow by Melissa Stewart. Illustrated by Constance R. Bergum. Atlanta, GA: Peachtree Publishers, 2009. Available now. It's time for a new book about what animals do in the wintertime. The others are getting old and out-of-print. This one will do nicely. The book opens with a huge winter scene, mostly white space with a snow covered village tucked in dead center. A few children playing in the snow on the right hand side leads us to turn the page to discover that "under the snow lies a hidden world." Great illustrations of a mass of ladybugs, and over there a snake, tucked into a stone wall the children are passing. Next page shows a vole tunneling under the snow, alive and active. And so it goes -- combining hibernating animals with those who are active during the winter. Spring comes at the end of this 32 page picture book -- repeating the first scene of children playing on the right hand side foreground with the village tucked in the middle of the double page spread, except this time it's a springtime view. (added later) I just got a message from Melissa Stewart. She invites you to come over and visit her on her blog. She has a nice website, too, over here. Surprise! All the Nonfiction Monday reviews are here at my blog today! More information keeps flowing in about this conference being held the weekend of October 17th at the Sheraton Crystal City Hotel on the Virginia side of the Potomac River, just south of Washington, D.C. If you'd like more information and a list of who is coming, so far, then click here for the list and how to register for the conference. I'm very impressed, myself. A-hem. Notice how many who have the name -- Wendy ! Blew my mind it did. Four Wendy (s) and one Wendie so far. Confused? Take a gander at the spelling of the names. MotherReader's blog entry says that hotel reservations at our low conference price has ended, but the hotel still has open rooms and might be talked into giving you the conference price. Do ask. See you there? 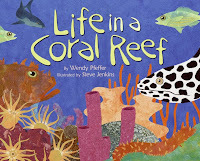 Life in a Coral Reef by Wendy Pfeffer. Illustrated by Steve Jenkins. Let's-Read-and-Find-Out Science 2. New York: Collins (an imprint of HarperCollinsPublishers), 2009 Available now. Well, the paperback is available now on Amazon, but I see no record of a hardback edition, despite the fact that I'm holding a hardback in my hand. Hmmmmm. However, when I check the publisher's website, I find that a hardback IS available. (cross-checking with Amazon, using the hardback's ISBIN, does force a hardback to show, but it doesn't show when you do a title search. This is weird. Ah hem. Enough with the Librarian-tech stuff. Back to the review. DISCLAIMER -- I love, love, love the Let's-Read-and-Find out series! I have noticed in the past few years that some of the older editions were being re-issued with new illustrators. This isn't one of them; this is newly written by Wendy Pfeffer who has been writing books for this series ever since the 1990s. And look at the illustrator! Award-winning Steve Jenkins! His amazing papercut illustrations use texture as well as shape to create very life-like pictures. Since this is a level 2 science book, the sentences are longer and more complicated than the usual Let's-Read-and-Find-Out book. But you need that to describe the complicated interactions of life underwater. There are still only a few sentences per page. Before you ask, "But did she include the current problems in the coral reefs? ", let me show you the last two pages of the book -- Find Out More About Coral Reefs. Yes, she did. Plus various fun facts. Other Nonfiction Monday posts are located here. Scroll down to see the whole list. Important news for Harry Potter fans. Another reason to go to Orlando. A Harry Potter theme park is due to open Spring 2010. 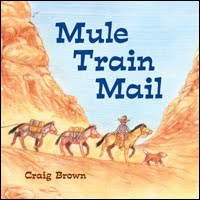 Mule Train Mail by Craig Brown. Charlesbridge, 2009. Available now. In 1896, there were no cars, trucks, or airplanes. Everything you bought in a grocery store was delivered by horse- or mule-pulled wagons, or in large bundles on the backs of mules. Even the mail moved along the roads this way. Can you imagine a place in 2009 that still gets everything delivered in bundles on the backs of mules, including the mail? That town is Supai --one mile deep on the bottom of the Grand Canyon. Anthony Paya delivers the mail to this town every day. This easy reading picture book begins: "Anthony the Postman doesn't wear a uniform. He wears a cowboy hat, chaps, and spurs." Instantly we want to know more about this Anthony guy. Why doesn't he wear a uniform? Why is he riding a horse and what are those other animals tied together following him? (turn page) Oh, he drives a mule train. Look at all those bundles and packages that are gonna have to be loaded on the mules, along with the mail, before he can lead them down, down, down the wall of the Grand Canyon to his customers. Soon the illustrator turns the book sideways, because he needs two pages top to bottom to give the feeling of the long zig-zag path going deeper and deeper into the canyon. Once the mule train reaches the canyon floor, the book returns to the wide doublepage spreads. This book works well both as a simple picture book story and a factual description of a different way to deliver the mail. LC has put it into J383.143 -- along with other books about mail and the post office. A portion of the sales will be donated to the Havasupai Head Start program to help children in Supai develop early reading skills. For more information about this Native American tribe and how the author/ illustrator researched this book, check out the Charlesbridge site here. Other Nonfiction Monday posts can be found here. It's Labor Day, and my urge to do a Nonfiction Monday post is on vacation. It's the last day the pool is open, but I have no desire to go. The sky was cloudy all day, threatening rain and temperatures stayed cool. Definitely not pool weather. On the other hand, it's also the last day of the Maryland State Fair. My husband and I took the 9-year-old and her friend to the fair yesterday. Today -- her friend's family took her and several other 9 - 12 year olds to the fair, again. What a weekend for her. She fell asleep quickly tonight. And yes-- I do realize that the header for this post is using British spelling. Sometimes words just look better that way. With Global Warming, October will be, too. Those of you who have kept up with this blog, might remember my adventures with spiders at the library's Information Desk last year. If you don't, click here to revisit and here. Don't expect a picture with THIS blogpost. I can hardly bear to go into the 500s in the spider section to weed books. yuck. Anywho, I just checked the position of the Children's Info Desk. And moved it a couple of more inches thisaway -- to make sure that I'll be sitting in the space between the lights -- not under the lights. Spiders drop from those lights all month long. Now, in order for them to get me, they'll have to drop a strand of web, then get it swinging in my direction. No. Don't tell me that simply by getting up to help people find material, I'll start a breeze that will help them swing. Nooooooo! I've long ago decided that I'll never die by drowning -- since I've already drowned twice. Once when I fell (was pushed?) out of a boat into a pond at age 3 or 4. I blacked out and came-to on the shore with no idea how I got there. Then again at age 5 or 6, when a cousin tried to show how he could 'rescue' me, while we were 'swimming' in a river. I fought so hard that we both were pulled under and were rescued by a passer-by. I was still angry and ended up flailing at the passer-by (after she had pumped water out of my lungs), not being grateful or courteous at all, and stomped on home. Not caring if my cousin found his way back to my house, where he was staying for a while. Unfortunately he didn't get lost and ended up getting home right after I did. 2002 and 2003 were busy years for me. My book, TO FLY, THE STORY OF THE WRIGHT BROTHERS, came out from Clarion and suddenly I was in the hands of their marvelous marketing department. Marjorie Naughton is the wonderful head of the department. I still visit with her every year at Clarion booth when I attend ALA. Elena Murphy made most of the arrangements for school visits and other events for me. (She changed her name to Elena Melendy halfway through our time together.) And her lovely assistant was Molly O'Neill. Now, Molly has gone on to be an editor! 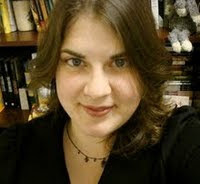 First with the short-lived Bowen Press and now she is an assistant editor at Katherine Tegen Books, an imprint of HarperCollins Children's Books. A week or so ago, another blogger interviewed her. But about her views on Marketing! If you click here you'll learn lots about the marketing side of publishing. Having been one of the authors 'handled' by this marvelous marketing team I can attest to her expertise. 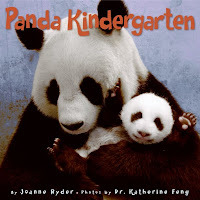 Panda Kindergarten by Joanne Ryder, photographs by Dr. Katherine Feng. Collins, an Imprint of HarperCollins Publishers, 2009. Available now. Pandas are so cute -- until you discover how large they are. So, what could be cuter than a whole kindergarten of baby Giant Pandas? I counted at least nine in one picture, and sixteen in another. Playing and growing up together should help them learn panda social skills that will be useful when they are released in the wild. Joanne Ryder's lyrical, easy reading words are the perfect accompaniment to these luscious photographs. I especially like the faint imprints of Chinese flower and leaf designs in the blank areas of the pages. Very unintrusive -- you'll hardly notice them -- yet they give a very Chinese flavor to the book. These photographs of baby pandas playing through their day were taken at the Wolong Nature Reserve, the largest unit of the China Conservation and Research Center for the Giant Panda. A good book for a preschool or early elementary introduction to the Giant Panda. If you must have facts about Pandas for a report, there are a few at the end of the book. 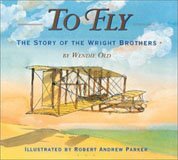 Other Nonfiction Monday posts are on Anastasia Suen's Picture Book of the Day Blog.